The Ninth Circuit upheld an injunction against the ban, but will the Trump administration ask the Supreme Court to weigh in? A federal appeals court has rejected yet another of the Trump administration’s attempts to lift a block on the transgender military ban while lawsuits against the ban make their way through the courts – setting the matter up for potential Supreme Court review. The U.S. Court of Appeals for the Ninth Circuit Wednesday denied the request to lift an injunction issued by Judge Marsha Pechman, who is hearing Karnoski v. Trump, one of four suits challenging the ban. The suit is being heard in U.S. District Court for the Western District of Washington, based in Seattle. District judges in all four suits have issued injunctions that keep the ban from going into effect while the cases are heard. Kanrnoski v. Trump is set to go to trial next April. Pechman had actually issued injunctions against the ban twice – in December and again in April. The second injunction came about when Justice Department lawyers contended that a March memo from the White House providing the administration’s justification for the ban constituted a new policy, not the one announced by Donald Trump via Twitter last July, and which Pechman had blocked with her December injunction. She ruled that no, it was the same old policy. If the Justice Department seeks Supreme Court review, it will likely do so before the week is out, legal experts told the Blade, meaning Kennedy could consider the injunction, if not the merits of the case, before his retirement. An attorney with Lambda Legal, which filed Karnoski v. Trump along with OutServe-SLDN, said Kennedy is unlikely to make an anti-LGBT ruling. 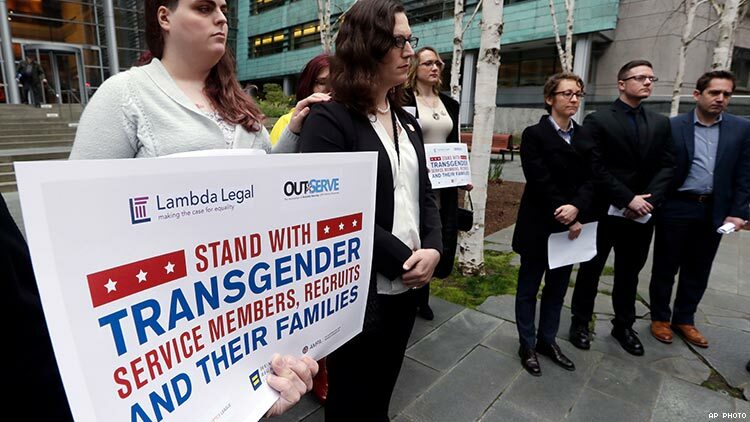 In Karnoski v. Trump, Lambda and OutServe-SLDN represent current and aspiring trans service members as well as three organizations, the Human Rights Campaign, American Military Partner Association, and Gender Justice League. "Once again, another court has held off Donald Trump and Mike Pence's desperate attempts to impose their extreme anti-LGBTQ agenda on the U.S. military," said a statement issued by HRC national press secretary Sarah McBride. "After a string of victories for transgender troops and enlistees at the district court level, this appeals court ruling reinforces that there is simply no need or legitimate reason to bar capable and willing transgender Americans from serving their country. We are grateful to Lambda Legal and OutServe-SLDN for their representation in this critical case, and we hope that the constitutional rights of transgender Americans will continue to be upheld by the courts as this case proceeds."